So reads the last text message I ever received from my Mum, Merryl. She sent it to me in the minutes after Essendon’s Men’s VFL team that I had some involvement with lost a close run Preliminary final to the Casey Demons by about a goal, thus ending our 2018 season one hurdle short of a Grand Final appearance in September last year. I’d secretly hoped the boys might get up and give Mum the chance to see one last Bombers flag – this time with one of her kids directly involved – but sadly as it turned out she wouldn’t have made it to Grand Final day even if the Bombers had, passing away peacefully with my Dad Kevin by her side on the Thursday morning of the following week, September 20th 2018. By the time she sent me that message Mum was already struggling with drowsiness and concentration as a result of the morphine she was being given to manage the pain caused by the cancer that had taken over her body, but she wanted me to know that she was watching and thinking of me, and of course of her beloved Bombers. Mum’s love affair with the Essendon Football Club really began at the age of 4 or 5 during the era of John Coleman taking speccies on opposition heads at Windy Hill. She was born in 1944 into an Essendon family, where both her Dad and her Grandmother (his Mother) were wildly passionate about footy and the club, and she started attending games with them during those halcyon days. As I got older she loved telling me the story of being dragged through the crowd at Windy Hill as a toddler by her elderly Grandma, petticoat hiked up in one hand Mum in the other, hoping to find the best vantage point. Her Dad preferred to stand on his own as his Mum was so passionate about the club that she would at times embarrass him with her vocal contributions at games – so it was left to the very young Merryl to stand with her Grandma while her Dad found his own space. I didn’t have the heart to tell Mum later that clearly the apple didn’t fall too far from the tree, she often struggled to contain her own emotions at games and would yell out her support of the club and occasional derision of an umpiring decision, much to my Dad’s (a long time umpire himself) chagrin. 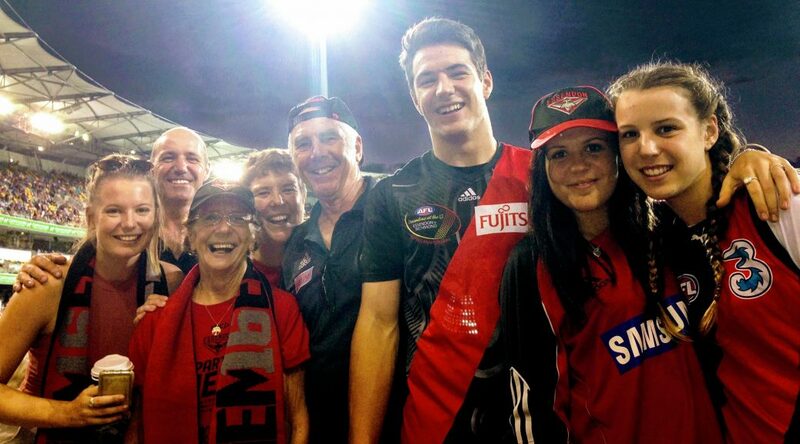 Mum was passionate in life, as in football, and loved 3 things above all else; her family, her friends, and the Bombers. She loved to talk about the club, whether excited about a young recruit or reminiscing on her favourite players of the past, Tim Watson and James Hird at about the top of her historical list, fellow South Gippslander Dyson Heppell a favourite of the current crop. It wasn’t unusual for her to raise a passionate defence of the club or its players at a dinner party or social event; my Dad’s Collingwood supporting brothers particularly enjoyed stirring her up at annual family gatherings. Mum’s brother and sister are also staunch Bomber fans, as are their kids and all my siblings. 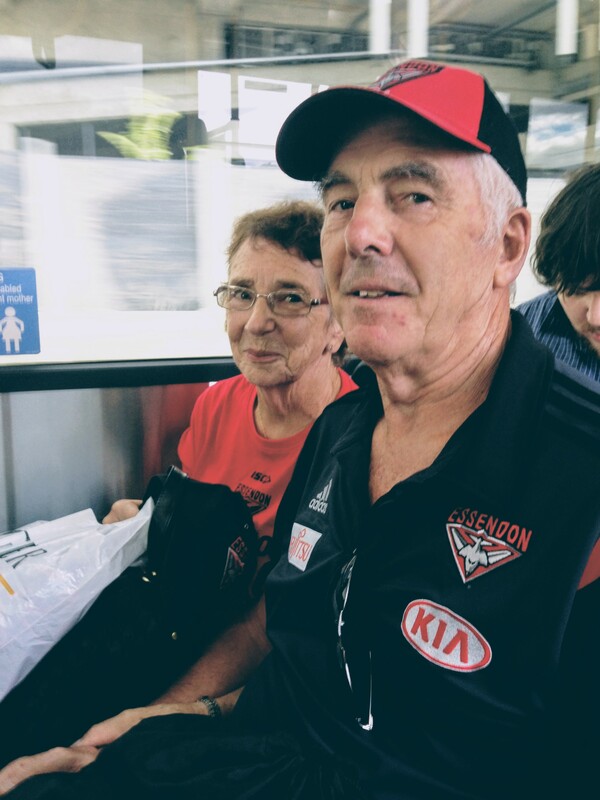 Despite her family never having any official involvement with the club before I joined the board in late 2014 my entire immediate and much of my extended family, particularly on Mum’s side, have been passionate Bomber fans going back generations, with Mum very much the matriarch over the past several years. Dad was a teacher for 35 years which saw he and Mum move around a little early in their marriage, finally settling in the small South Gippsland town of Korumburra in the late 60’s, a town which in spite of its modest 5,000 or so population had two football/netball clubs (since merged) – Korumburra and Bena. When it came time for my oldest brother Steve to start playing footy he’d been training with Korumburra – seemingly the obvious choice in the town it was named after – but a few of his mates from school were playing with Bena and much more importantly to Mum Bena wore Essendon jumpers with the red sash on black, so in her mind the decision was easy – we were to be a Bena Football Club family. My sister had a long and distinguished netball career for the club and both of my brothers and myself played junior and senior footy for them, with Mum holding down various volunteer roles over that period including being team manager of the thirds for a number of years before becoming a qualified trainer. Mum must have volunteered for the club for near enough to 20 years as we all went through the junior grades and onto seniors; when a player would get injured she’d run onto the ground full gusto in her red and white trainer’s uniform, complete with gumboots in the peak winter periods. If it was one of her sons injured the run had just a little more urgency – provided she hadn’t taken leave to go and watch my sister play netball of course. Occasionally when I was playing juniors and thus had the early start, the planets would align and the Bombers would be playing at VFL Park (the closest VFL/AFL ground to us) on a Saturday afternoon. So Mum and I, along with whichever mate(s) was lucky enough to jump in that day, would take off and head for ‘Arctic’ Park to try to catch as much as we could of the reserves, before the big game. Complete with thermos and home made food – in a family with 4 kids we wouldn’t be buying food at the ground – we’d huddle on the old wooden plank seats with high expectations of a Bomber victory, the drive home either featuring scarves out the window and the footy wrap on the radio or virtual silence depending on the result. It was the 80’s and early 90’s, Essendon fans got used to winning. If Sheedy’s men were playing elsewhere, as they usually did, we’d be in the car with the radio on at our local footy, and if Mum was in her trainer role standing on the boundary I’d update her with the Essendon match scores at the quarter breaks. Once all of her kids had grown up and our sporting careers were over it became easier for all of us to get to AFL games, including Mum who no longer had to drive us to our own games or come and watch us. Over more recent years my wife Kellie and I would often meet Mum and Dad at the stadium now known as Marvel a few hours before the game to have a meal together before watching the Bombers play, the mood when we’d meet afterwards determined by the success or otherwise of the red and black on the field that day just as it had been all those years earlier on the drive home from Waverley. Mum and Dad retired to Queensland about 8 years ago, and whilst they loved the lifestyle that provided Mum couldn’t have done it without a subscription to Pay TV to keep up with the footy news in a state where the AFL isn’t filling the back pages or news headlines like it does in Victoria. I’ll never forget making the phone call to tell her and Dad that I’d been elected to the board of the Essendon Football Club in late 2014. She didn’t play favourites and was equally proud of all of her kids and grandkids, but this was the Bombers! That one of her kids would be directly involved with the leadership of the club was a great thrill for her, and I relished seeing how much she loved it. I could almost hear her telling the neighbours and friends all about it, in fact pretty much anyone within ear shot. With the Bombers now based out at Tullamarine and Mum & Dad flying in and out often from the airport to visit the grandkids she’d always insist on stopping at the club for lunch or a coffee – often while there introducing herself to club and cafe staff as my Mum. When I recently spoke to a long time Essendon staff member about Mum’s passing he recalled meeting her in the cafe several times over the past few years, he only knew who she was because of course she’d proudly tell him I was her son. When she’d get to our place a few hours later she’d tell me with a broad smile that she was “talking to such and such today”, like they were old friends. Mum’s can be embarrassing like that, in the best way. On one of her trips down a year or two ago she brought me a 1971 VFL Park members medallion and an Essendon Members “Programme” from the club’s centenary year of 1972, I’m not sure if they were hers or her Dad’s. She often brought me down trinkets and keepsakes from the history of the footy club, and specifically her history with the footy club. I wish I’d asked her more about them. For coaches, staff and players of AFL Clubs the focus tends to be pretty narrow by necessity, the result of the coming week’s game can understandably take precedence over almost everything else, so it’s easy not to think too much about the fact that for every young player wanting to get a game or every superstar signing a big contract there’s a supporter out there whose mood has for most of their lives been determined by whether the club won or lost the previous weekend. It’s important for those in leadership positions driving the direction and culture of footy clubs to remember those people, particularly as membership of clubs these days climb to huge numbers making it difficult to think of supporters as individuals. People who support their chosen club for no reason other than their love of it and the game, who dip their hands into their pockets when the club asks even when they often can’t really afford it, who show up in droves even if they know their club is a longshot to win. People whose earliest memories are of supporting a footy club, and who are still watching them even as the end draws near. People like my Mum, and so many thousands of others. In Round 1 Essendon will play their first official match that Mum hasn’t either watched or been hanging on the score of since the Coleman era. I’ve noticed her passing more lately, because by March we would in previous years have had at least half a dozen detailed conversations about the coming season, about the club’s chances of winning the long awaited next Premiership, about the new crop of draftees, about which of the young players were a chance to go to the next level, and about how my VFL team is shaping up. Instead I’ve got my 7 year old daughter asking when the footy starts again every few days and wanting me to setup a ‘tipping’ competition at home for us, while my 2 year old loves pulling out her Bombers beanie and wearing it around the house even when it’s 30+ degrees outside. And so the circle continues. When the club run out for their annual ‘Clash for Cancer’ game against North Melbourne in July, somewhere in the background of the club jumper among a thousand or so others in very small print will be my Mum’s name, an innovation the club have introduced this year for a relatively moderate fee to help raise funds for Challenge Cancer Support. I think she’d like that, but in truth she’s been running out with them for 70 years. 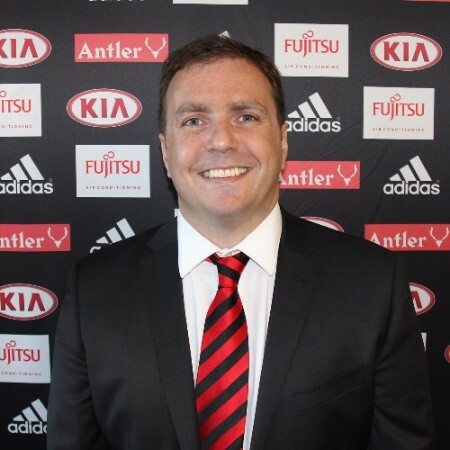 Paul is the current President of the Essendon Football Club Men’s VFL team and a former Director of the Essendon Football Club.